The Hot Wheels Chevrolet Camaro will feature classic Hot Wheels-style "Red Line" wheels. Whenever I'm in the drugstore, I still stop by the aisle where new Hot Wheels cars hang in their blister packs to see what's new there. If there's one I like, I buy it -- for myself. My wife does not understand this. Why in the world, when as a automobile writer I get to drive real Bentleys, Shelbys and Aston Martins, would I want to take home a tiny toy version of the same car? Well, for one thing, I have to return the loaners but I get to keep the toy. Alas, this one won't be available. And I'm not the only grownup who likes toy cars. Mattel (MAT) doesn't have a firm number on this, but it's undeniable that a significant percentage of Hot Wheels collectors are of legal driving age. That's one reason Mattel's Hot Wheels division teamed up with General Motors (GM) to create a special Hot Wheels version of the Chevrolet Camaro. The special edition car, revealed at a custom car trade show recently, will only be available for a limited time and will cost about $7,000 more than a standard-issue Camaro. The two brands originally generated interest in a Hot Wheels Camaro with a gleaming green concept car displayed at car shows around the country last year. But this just announced car doesn't look much like that green machine. The show car's mirror-like green finish was deemed too expensive and difficult to maintain for use on a production car. Instead, this car gets a metallic blue paint job with a matte black stripe that stretches from nose to tail. In addition, a "blue flame" Hot Wheels decal adorns the rear fender and there's a red stripe around the outside of the car's 21-inch wheels. The red line on the wheels -- the biggest wheels ever offered on a Camaro -- mimics the red line on the wheels of early Hot Wheels cars from the 1960s and '70s. 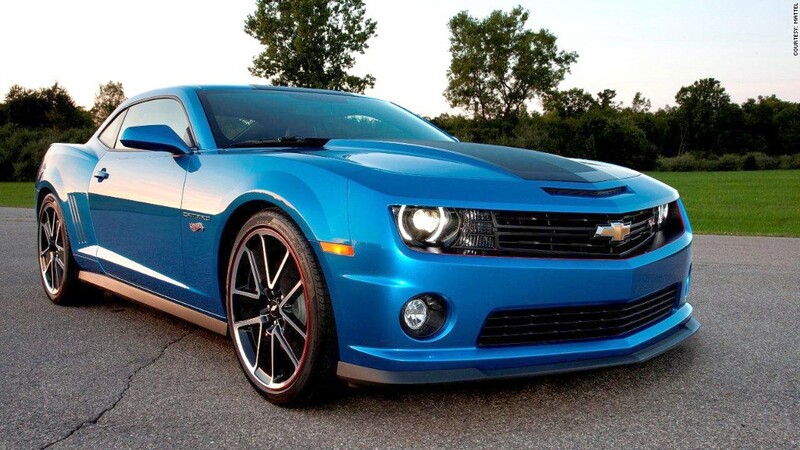 The special edition Camaro also has a grille and spoiler like those on the high-performance Camaro ZL1. But the Hot Wheels Camaro doesn't include any performance upgrades. If you're thinking this car could be a future collectible, Phil Skinner, collector car market senior editor for Kelley Blue Book, said, "maybe." In the short term, special edition packages like this one -- ones that don't involve any performance upgrades -- do nothing at all for a vehicle's value on the used car market. But 25 to 30 years later, assuming the car's been kept in good condition, this car could be worth as much as 25% more than a run-of-the-mill 2013 Camaro will be. 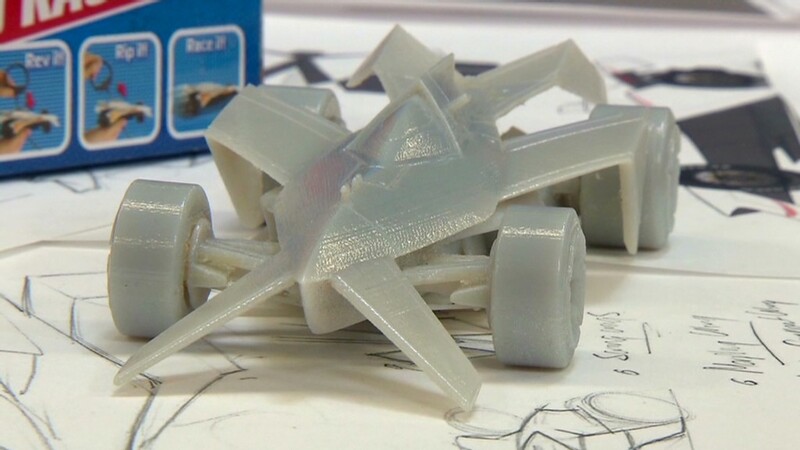 The idea for a Hot Wheels car came up during a routine meeting between Hot Wheels representatives and GM, said Felix Holst, creative vice president for Mattel's Wheels division. "In that discussion, one of our marketing guys had the audacity to suggest we should do a full size production car," he said. The idea generated enormous excitement. It resulted in, first, the shiny green concept car and now this blue limited edition production car, he said. Dealers are taking orders now and GM will produce the Hot Wheels Camaro from January until the 2014 Camaro goes into production in June, GM spokesman Monte Doran said. Hot Wheels will also sell its own 1/64 scale version of the new Camaro. I'll be looking for that one at the drugstore.